U.S. Sen.-elect Joni Ernst speaks to supporters on Tuesday in West Des Moines, Iowa. The polling firm Selzer & Company was credited with calling the race correctly. After Republicans won Senate, House and statehouse elections in decisive routs Tuesday, my colleague Nate Silver and many others said pre-election polls were skewed toward Democrats. That makes this the second consecutive national election with polls skewed toward one party: In 2012, they zagged toward Republicans. That prompted us to ask pollsters how they thought they did. We’d conducted three polls of top campaign pollsters before the election, to learn how they did their work, what ethical principles they followed and where they saw their industry heading.1 Now we wanted to know how they assessed the performance of their polls. The first question of our brief post-election poll was, “In light of Tuesday results, did election polls do well this year at depicting the electorate’s views?” Seventeen of the nation’s most prolific political pollsters responded. Those who said polls did well had some valid reasons. Barbara Carvalho of Marist College argued that polls got some trends right: Voters were worried about jobs and the economy, and dissatisfied with Washington, D.C., and President Obama. Women and independents were moving toward the Republicans. Plus, it’s possible polls accurately showed what people thought on the day they were asked, but not on the day they voted. “At the time many of the polls were taken, they showed close races when they were close and several organizations showed movement to the GOP from previous polls closer to Election Day,” Carvalho said. That isn’t good enough for Matt Towery of InsiderAdvantage. “We captured the trends but not the wave,” he said. Towery was unusual in his willingness to say openly that polls had a bad night. Four of the seven pollsters who didn’t answer yes requested anonymity. Just two of the other 10 made the same request. Carvalho said bad polls drowned out good ones in models that combined them, such as FiveThirtyEight’s. She pointed out that some pollsters spotted Republicans’ edge in Iowa, Kansas and Colorado. “Models tended to mute differences and trends … because they were not part of the average,” Carvalho said. “Faster, cheaper, later, needs to be balanced with good science.” The challenge is to identify ahead of time which pollsters are spotting the correct trends and which should be muted. One anonymous respondent specifically predicted that pollsters will need to fine-tune their methods of determining who will vote. “The problem in many, if not most, polls is that they decide a priori what the electorate will look like,” the pollster said. Who got it most right this time around? We asked which polling organizations were particularly successful. 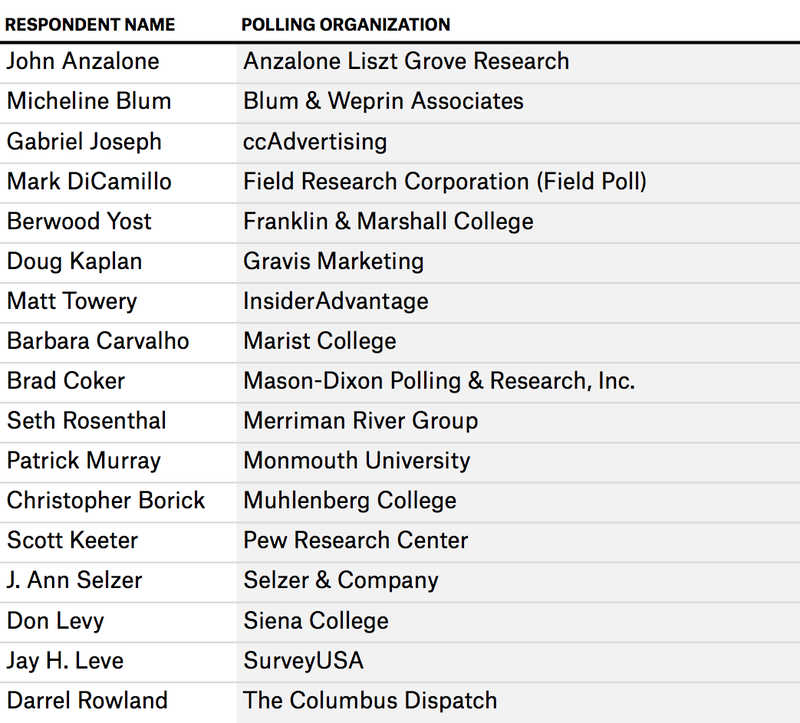 The only two votes for an organization the pollster didn’t work for went to Selzer & Company. The Iowa firm looked worthy of its A+ in our ratings by giving Joni Ernst a 7-point lead in the Iowa Senate race when the other 10 most heavily weighted polls in our database showed Ernst trailing, tied or leading by 3 points or less. Ernst won, by 8 points at last count. Pollsters were less reticent when asked to name pollsters who stumbled. One answered, “Most everyone.” Two specifically named YouGov, and one each named Public Policy Polling, Fox News and Zogby. Brad Coker of Mason-Dixon Polling & Research, Inc., was among the majority who didn’t name any specific winners and losers. “Everyone has good years and bad years,” he said. Because it’s never too early to turn to 2016, we asked about the Senate race next time. How many seats would Republicans control in 2017? Six gave a number. Three said 51.3 One said 49, another said 48 and Joseph said 57. Anzalone related a different experience. “It was a 24-hour enema,” he said. We started with the 70 pollsters with the most election polls in our database. Then we reached out to the 62 who are active and reachable. We heard back from 45, including 42 who expressed interest in answering our survey questions. We sent the first poll in September and published the results this month. We put out the second poll starting Oct. 12, using SurveyMonkey to collect the responses. The third poll started Oct. 24, again using SurveyMonkey. Our fourth poll, again using SurveyMonkey, started and ended on Nov. 5. Our 17 respondents include commercial and academic pollsters. Not every respondent answered every question. As with our prior polls, we granted anonymity when requested so our respondents would speak freely. That includes all error — it misses skewing toward either Democrats or Republicans. YouGov’s Rivers also reported on the company’s polling in all 435 House races. The average poll overstated Democratic two-party vote share by an average of 1.74 percentage points, with a mean absolute error of 3.75 percentage points. One of them, more precisely, said three fewer than whatever number the GOP ends up with when all of Tuesday’s races are called. That number looks likely to be 54.